As readers will know from a previous post, I'm aware that some find my focus bar too complex and too confusing. 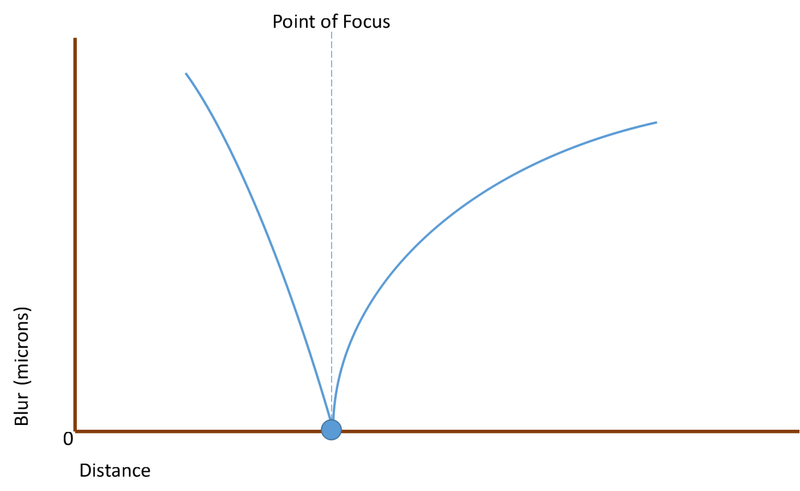 Hopefully this post will help those struggling to understand the focus bar. First, let's talk about focus and depth of field. In the real world, what is called object space, we recognise three distances. The point of focus (d2), the near depth of field distance (d1) and the far depth of field distance (d3). On the sensor, in the image space, there is a so-called circle of confusion, ie a blur, that if we are inside this circle, then we perceive things as 'in-focus'. For a full frame DSLR you will typically see this CoC stated as 29 or 30 microns, or 0.03mm. For a crop sensor camera, this CoC is reduced by the crop. We won't complicate things here, but we will note that a CoC of, say, 30 microns, is only just acceptable, ie good for digital projection, but not necessarily for high quality (close scrutiny) print viewing, where a CoC of, say, 15 microns would be considered a better criterion. So far we haven't mentioned diffraction, which is an additional blur that 'adds' to the defocus blur from the lens. Without proof, it is normal practice to 'add' the defocus and diffraction blurs in quadrature, ie Total_Blur = SQRT(Defocus_Blur^2 + Diffraction_Blur^2). Handling defocus and diffraction blur are the two 'secrets' to getting a tact sharp image. 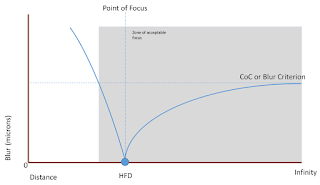 Here we see the classical defocus curve. At the point of focus the blur is zero. 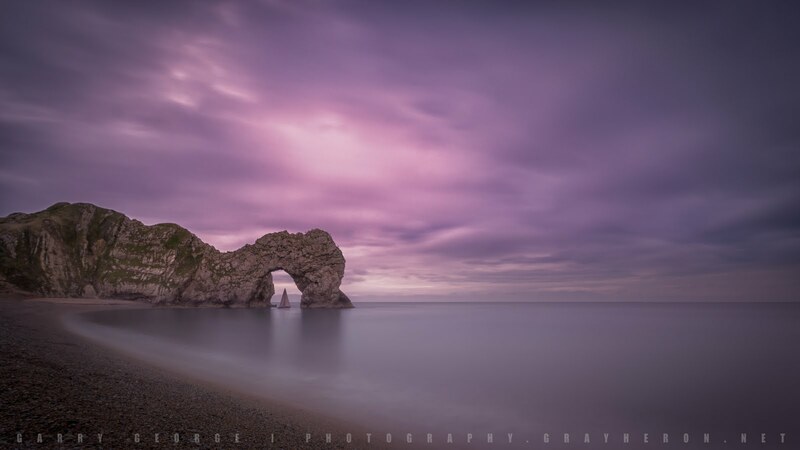 As we move away from the point of focus the blur increases, but the near and far curves are not the same. That is the defocus towards the camera is different than towards infinity. Without any equations, we can see how the focus zone appears to us. The curves illustrate that focus is not a 'black and white' affair, and thus the CoC blur criterion part of a continuum of defocus from the point of focus. 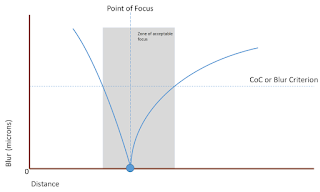 Let's now start using this knowledge of defocus: in this post let's continue to ignore diffraction. We now see that the depth of field goes from a near field distance, that is HFD/2, to infinity. 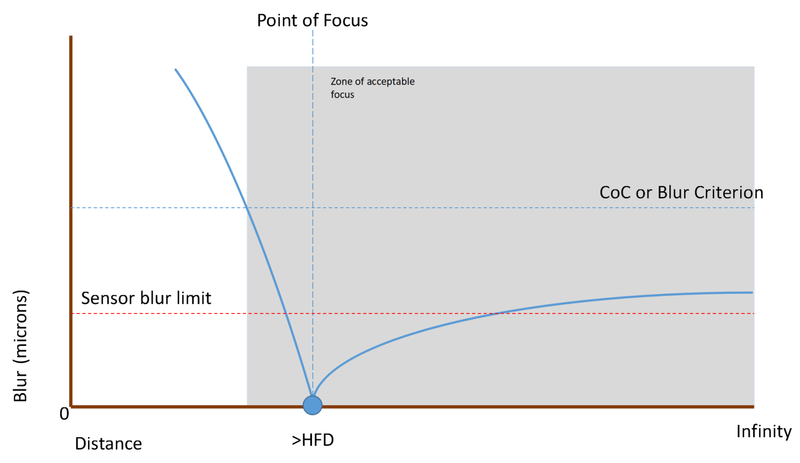 But we also see one of the limitations of HFD focusing. That is, for a large part of the image, all the way to and at infinity, the blur is close to the barely acceptable CoC blur criterion. Of course if we were to focus at infinity, then at infinity the blur would be zero. But as we know, if we do this we loose a lot of depth of field in the near field. Clearly there must be a better place to be, ie between the HFD and inifinity. 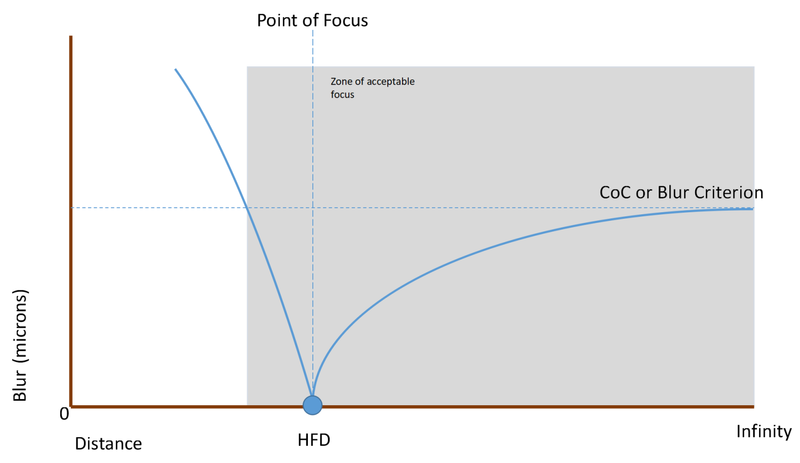 But how far should I focus away from the HFD and towards infinity? 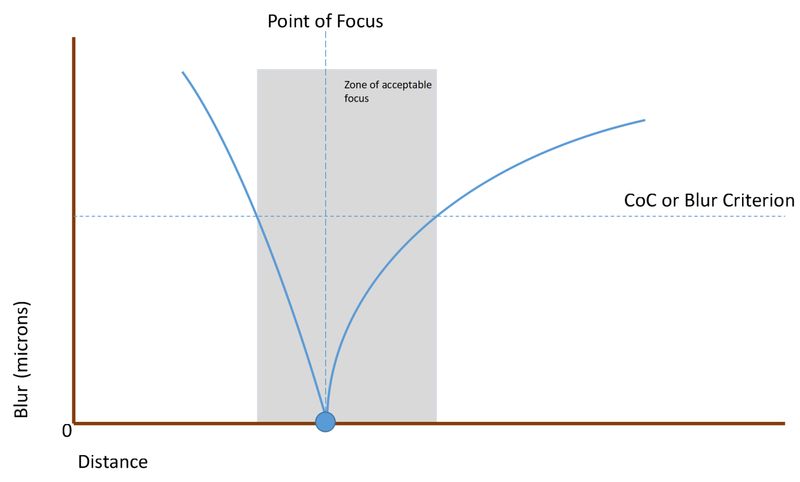 Fortunately we have a very easy way to know when to stop focusing. Without proof, we stop focusing when the defocus blur becomes less than twice the sensor's pixel pitch. Thus on my 5D3, with its 6.3 micron sensor pitch, I will not seek out defocus blurs less than, say, 13 microns. This last cartoon shows the sensor limit, which the focus bar alerts you to. 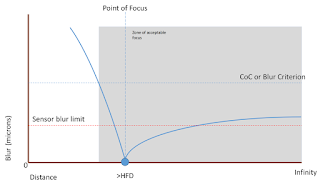 Thus, if you use the focus bar, you will always be able to set the optimum focus, ie an infinity blur between the HFD (CoC criterion) and the sensor limit. 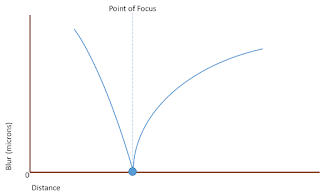 The focus bar tells you what the infinity defocus blur is and provides you information on the defocus blur, the diffraction blur and the total blur of the defocus and diffraction blurs combined in quadrature. In future posts I will talk about diffraction blur in more detail. For now, I hope this post has helped those struggling with the focus bar, and the concept of infinity blurs, understand the difference between the CoC blur criterion and the defocus blur that varies as you adjust focus.